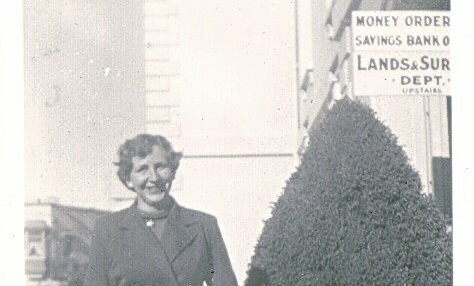 I joined the Public Service in 1953, becoming a clerk in the Lands & Survey Department. The offices were on the upper floor of the old Post Office building overlooking Market Place, where the Forum is now located. At this time the department was beginning to wind-down their activities in purchasing and developing large farms for closer settlement by ex-servicemen. As well as development work, the department had varying responsibilities - leases of Crown land to administer, scenic and domain boards to monitor, legal responsibility for surveys and records of both freehold and crown land, and sale of maps to mention a few. The Department was also responsible for the administration side of the large Molesworth Station in the Upper Awatere. In those days few ordinary people had bank accounts and all wages were usually paid in cash. For Molesworth staff these pay packets were parcelled with brown paper and tied with string, then a stick of red sealing wax was melted at one end and blobs attached to the ends of the string, adhering it to the wrapping-paper - these were impressed with a key-handle to add security. All quite fascinating! The packet was then sent by insured (for the total amount enclosed) post to Molesworth. All of the `lower ranks` of staff had to sign in the Attendance Book on arrival at 8am. At 8:05 a red line was ruled across the page for the day and those absent had their names written in red! There were over thirty staff in 1953, including a number of women who were clerks and typists. The `girls` usually had morning and afternoon tea apart from the men and subjects of conversation ranged from new materials at a shop we called Bradford`s Silk Shop in the Strand Arcade (everglazes, polished cottons etc. ), a new shipment of china to Ashley`s China Shop on the High St corner of the Strand, or on Monday morning talk of the Saturday night dances at the Boathouse or St. Pat`s by those who had attended. Current sewing and knitting were often discussed as at this time most women made their own clothes. Royalty was a popular subject and for the Queen`s 1954 visit we had a `box seat` from the old Post Office overlooking Market Place, where a reception dais was erected outside Girlings Department Store (now The Farmers). But our interest also extended to beautiful Queen Saroya of Persia (Iran), sympathising with her when she was divorced by the Shah for failing to produce an heir for the "Peacock Throne"! After a few years in clerical work I transferred to Draughting Division and studied for the NZ Institute of Draughting qualification. There I learned to do the standard lettering and figures using Indian Ink and pen-nibs of differing widths. The Draughting Division was mainly concerned with keeping records relating to land. Perhaps the highlight of my years of draughting was being given the job of searching all land titles within the Marlborough Land District through which the proposed Nelson-Blenheim railway would run. This was highly `confidential` and at no time was I to allow my work to be seen by any unauthorised person! I finished the work just before a general election and then the government changed and the proposed railway was scrapped! Another highlight was compiling the technical description of new boundaries of the Borough of Blenheim. These `descriptions` must be able to stand up in a court of law leaving no doubt as to what is inside the boundary and what is outside. 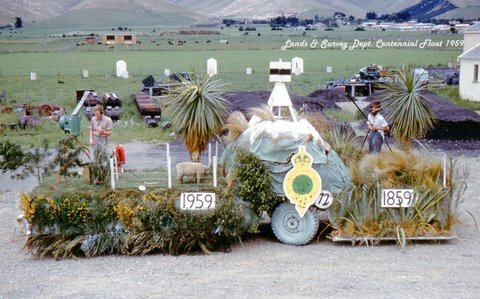 A particularly enjoyable few days were spent helping prepare a float (decorated truck) for the Centennial Procession in 1959. It depicted the history of surveying in Marlborough from the Wairau Incident in 1843 up to surveying methods used at that date (1959). Mr E Mallet seemed very dedicated to her work and obviously enjoyed it. I am currently researching the Nelson/Blenheim railway with the view of building it. Anyone who supports this idea may contact me. I spent most of my career at the Blenheim Office as one of the survey staff. The float was the brain child of Lyn Lord, Staff Surveyor at the time. That's me on the back. Lets hear from other ex-staff on this site. I started at the Dept. in Feb. 1952. I spent most of my career in the Blenheim Office as part of the Survey Crew. The float was the brain child of Lyn Lord. (Staff Surveyor) That's me on the back. Thanks for the site, lets hear from other ex-staff members. New Zealand. Dept. of Lands and Survey. (1976). The Department of Lands and Survey, 1876-1976: centennial. Wellington, NZ. Department of Lands and Survey. (1962, November). Forest and Bird, 146, p. 12-20. Millar, J.M. & Topping, Eva. (1949, February 15). Settlement of returned servicemen on land development blocks. New Zealand Journal of Agriculture. 78 (2), p. 161-176. One hundred years of Lands and Survey (1976). New Zealand Official Yearbook, p.1046-1048.